Head Up Guys…Attention*drumroll*… New Male Suit at R:A:D!!! 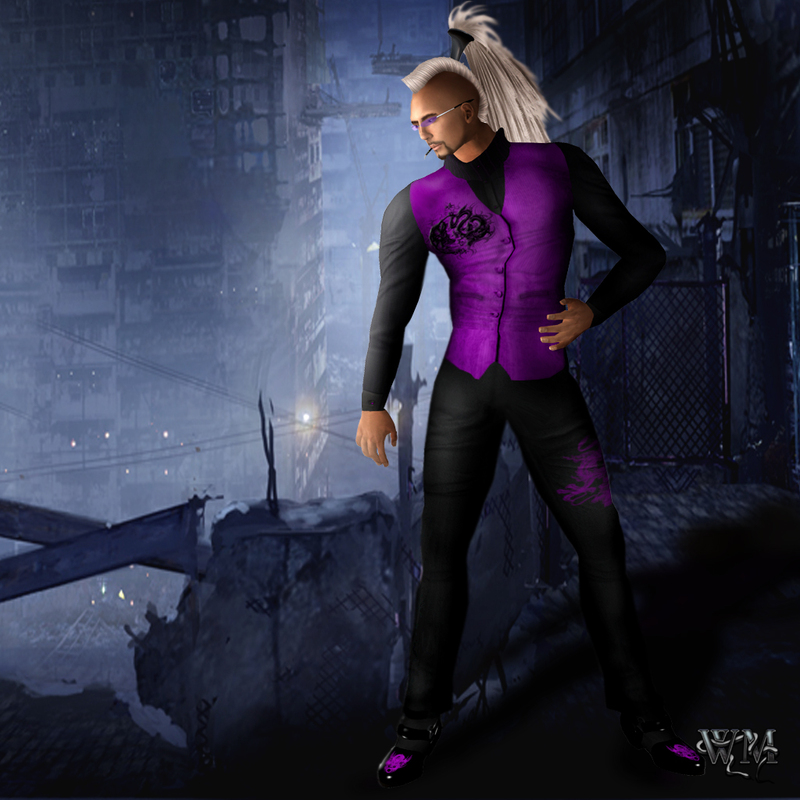 Attention guys..lately I catched Redclaw Inshan, designer of R:A:D – Red Alert Design, wearing his newest creation.. and for sure I had to snap it 😉 we ladies always want you guys dressed fashionable 😉 so take a look at the new R:A:D “Dragon Suit”! 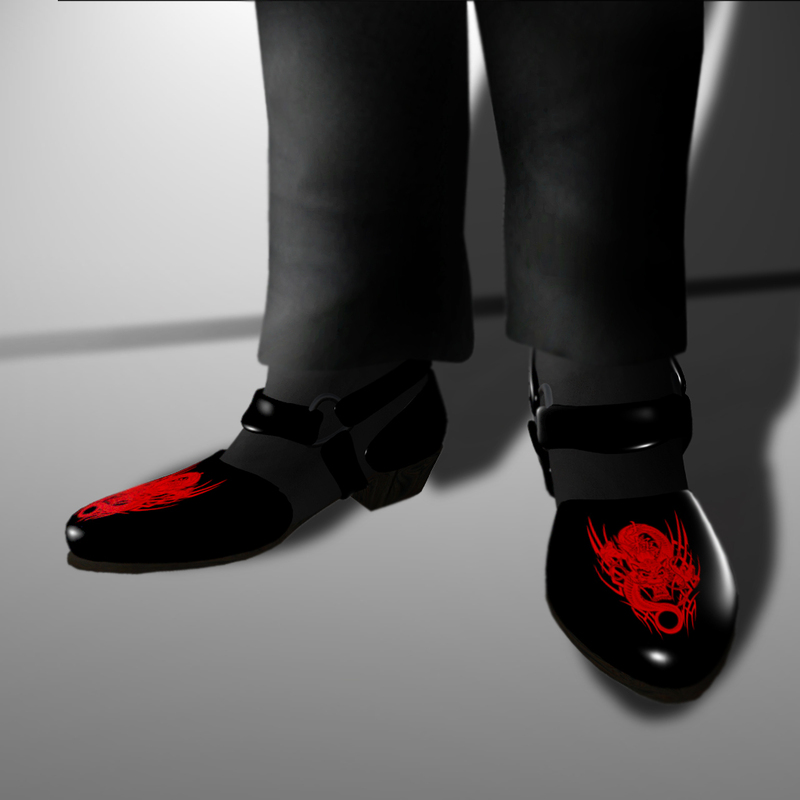 The “Red Dragon” is an amazing black suit with red asian ornaments that break the basic black texture in a fantastic way. No more boring black suits for the fashion loving guy 😉 With this suit you definatly will turn heads and show character! The suit basically is made of pants, shirt, waistcoat and jacket… and now…also the shoes are included! If you take a closer look you can see the brilliant texture with the great folds that really give this suit a very realistic look. Not only made with a plain black texture, the lights and shadows are perfect set! It really seems the texture fits every movement and pose… simply awesome! Lets get rid of the jacket to see the great waistcoat 😉 Made with an amazing detailed texture lightly asian looking, this vest really caught my eye. Like a trade mark for the suit every part of the outfit has one asian ornament on it as we can see here on the left side of the chest in black. The tiger and dragon ornament really makes a great eye catcher on the waist coat. All parts of the outfit comes in all layers you need to mix and match every possibility!!! “Melody” is a lovely short dress with exciting details! Only one shoulder is covered by a wonderful pink ornamented texture and a small shoulder “shawl” gives a nice accent. The top in front has 3 sweet little slits that imagine a peek in to a beautiful clevelage. There are so many taxtures combined and all in that amazing pink tone! The lighter belly part nearly looks transparent and the flexi skirt floats awsome down to the knees. Inga Wind Double Feature!!! New Release and new winter hunt item!!! Another great color of “Claire” found it’s way into the Mainstore of Inga Wind Clothing. As we all know Inga Winds provides not only one simple outfit if you purchase on of her designs, She always has more then one option per outfit as we can see again here. A wonderful wintercoat in snow white with one long and one short opition. And if you play around a bit you see that you even can combine both if you wear the short skirt option with the glitchpants of the longer one. Inga Winds Clothing means for me always great textures, amazing design and wonderful little details. Here we have a stunning hat, an amazing little scarf, 2 beautiful shoulderparts and a ver lovely belt. Each detail it self i made with great details again, The hat has an awsome hat band, the shoudler ruffles are repeat the had band texture, so does the scarf. This is whitness for a overall great eye for the complete outfit for me. The item of the winter hunt will change tomorow!!! According to the great new release of “Claire” in white all hunters have the chance to get another color version of “Claire” – sand is the object of the hunters desire!!! This version is a great arrangement of lovely brown tones what makes the difference to the new released black and white version! Only 8 of all snowflakes lying in the store have hunt pieces in their content, you need to find these 8 correct ones. I would not give away the great chance to hunt “Claire” in sand..and maybe find a nother great outfit in the Inga Wind Clothing Mainstore!